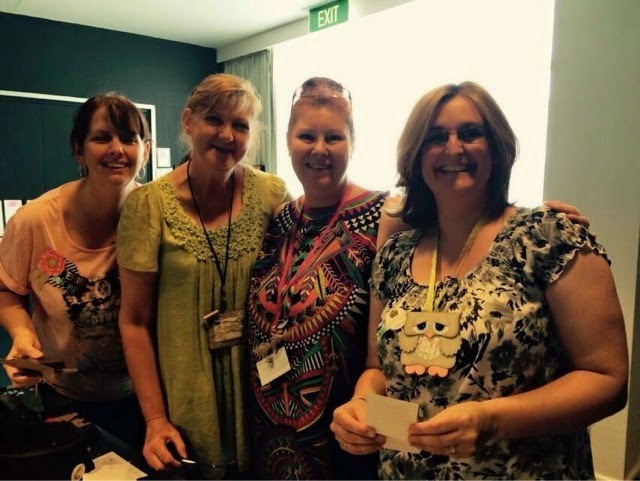 Welcome to the ESAD 2015 Occasions and Saleabration Blog Hop. You may have arrived here from Nerida’s Blog, or you may be beginning right here with me. WELCOME!! All you need to do is continue through everyone’s blog posts until you come full circle. I hope you are prepared to be inspired by all the fabulous ideas that these talented ladies will show you. I wanted to share my Lotus Blossom project with you all. I fell in love with the Lotus Blossom stamp set as soon as I saw it. How awesome that this gorgeous stamp can be yours for FREE with Saleabration. I think its one of the BEST freebies ever! I used it to make this gorgeous card holder. It holds the 3 cards and matching envelopes and would be perfect to give as a gift. You could do the cards in all the same colours or different colours, like I have. 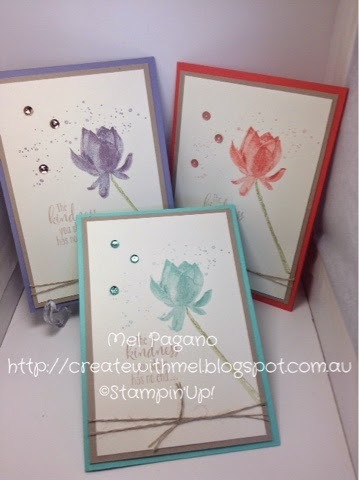 I have used coordinating inks to create my flowers – for example the base stamp of one of the flowers is Crisp Cantaloupe and the other two images are stamped in Calypso Coral – with the second image stamped off once, before stamping onto the card. 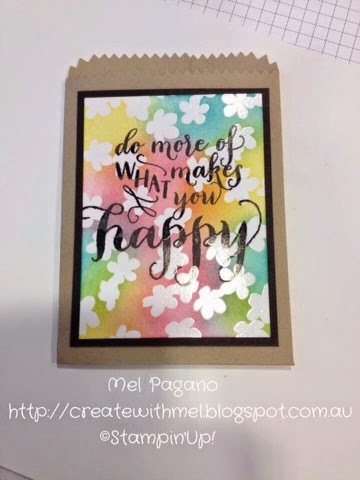 A bit of Gorgeous Grunge and some In Colour Sequins jazz up the cards nicely. Have a play with this gorgeous stamp. 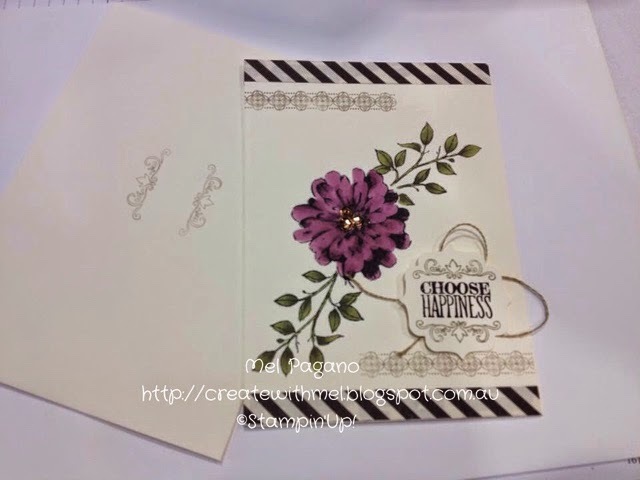 It looks great with a single colour stamped off or using two coordinating colours. I hope you enjoy the rest of the hop. 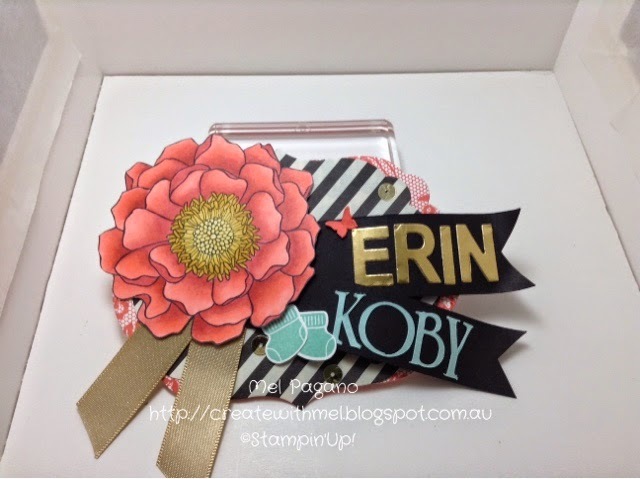 Now head on over to the talented Rachael Lewsley’s blog – My Stampin Haven here and see what she has created for you. I always like to add a little Thank You card ( and sometimes a surprise gift ) to the lovely ladies who place orders through me. Often those thank you cards end up being quite floral because they’re just so….well….pretty! So I was just a wee bit excited when some of my new goodies arrived this week and I got to play. 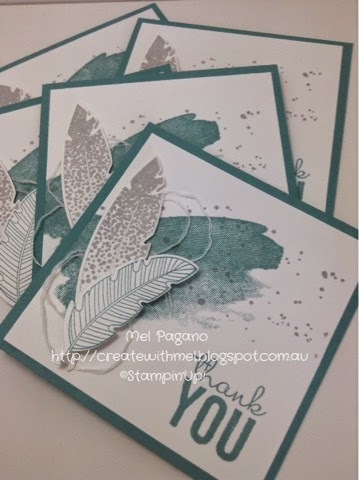 I used the Four Feathers stamp set and dies bundle that is still available in the Occasions Catalogue as a Returning Favorite to create these ‘not so girly’ Thank You Gift Cards. These cards are using Lost Lagoon and Smokey Slate. I have added speckles from Gorgeous Grunge (one of my absolute go to sets!) and the background from the new Perpetual Birthday Calender Set. Add a twist or two of the Painted petals cotton twine that has had the threads separated and you have created a gift card. Lost Lagoon base 3 1/2″ squared. Whisper White 3 1/4″ squared. Today was one of my most favorite days of the Stampin Up Year. Today was our team day!! Our team is one of the most supportive, amazing teams. We are known as the Eureka Stampers and It’s truly a blessing to be a part of it! We support each other on our private team page and via messages etc. but there is nothing better than getting together as a massive group! We gather together to share and inspire each other and of course stamp and create! So let me share with you some of our creations. We began with creating our own name badges for the event. I first saw this owl as a card at Bronywn Eastley’s blog and fell in love. I made it as a badge though, not a card. How CUTE is he! His little stick says ‘ All you need in life is a friend who has chocolate – I’m that friend’ – it’s from the retired Eat Chocolate stamp set that I was very excited to have found a couple of weeks ago! Here is a couple of pictures of us at the event…. 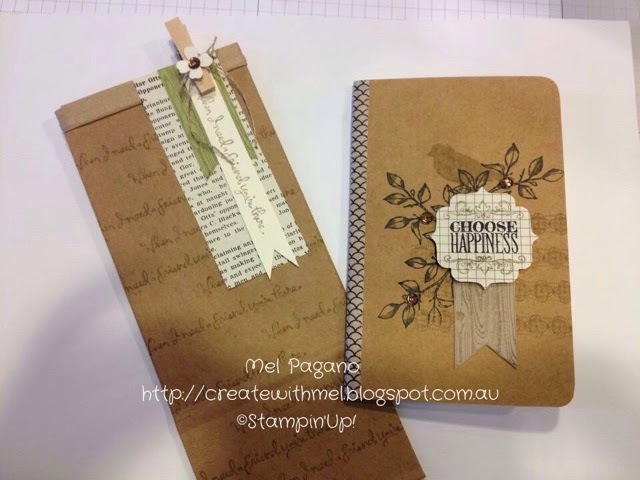 And our make and take goodies using the Choose Happiness Satmp set. And just a little something extra from our ‘play’ area… This one uses that amazing Irresistably Yours DSP that’s FREE from Saleabaration with every $90 order placed. I have just sponged it using Strawberry Slush, Bermuda Bay and Daffodil Delight. I’m really looking forward to using these in my PL pages. WOW. That’s a lot for one blog post! Lol. 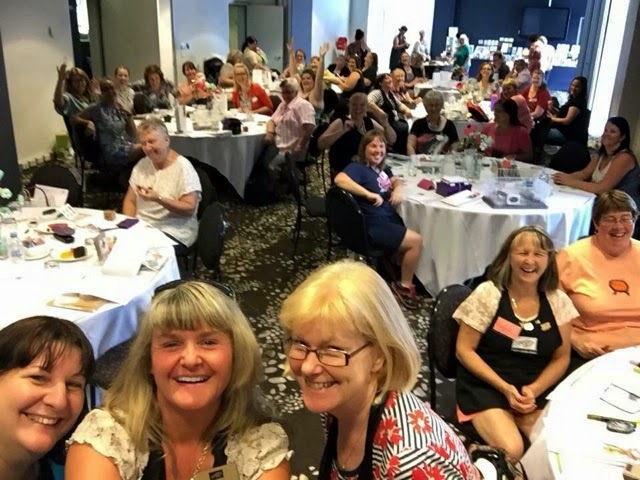 If you have EVER considered joining Stampin Up I would love to have you join our team and see for yourself how wonderful and supportive we all are. Saleabration also has some lovely extra bonuses if you decide to join now 🙂 Feel free to Contact me to discuss this further. 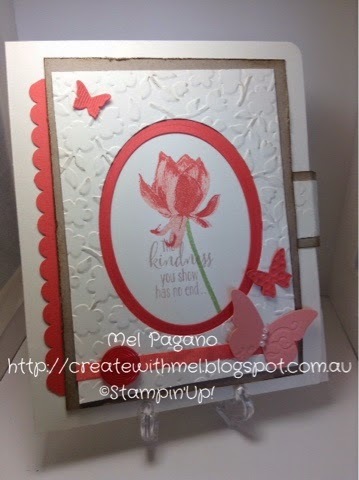 Here is a card I that we have been making at classes this week. 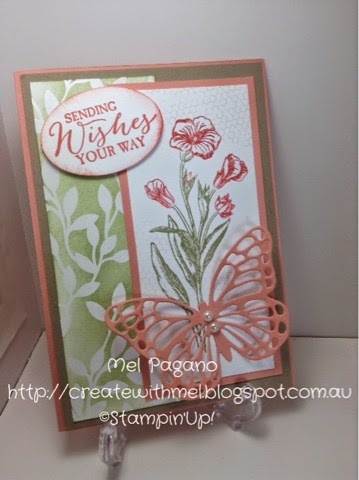 It is using the butterfly basics stamp set and the Irresistably Yours DSP from Saleabration. Now that paper is not much to look at in the catalogue. In fact I have had a few people say they didn’t like it from what they saw in the catty, but when they used it in class and understood what it was – they fell in love!! !…This paper is GORGEOUS! 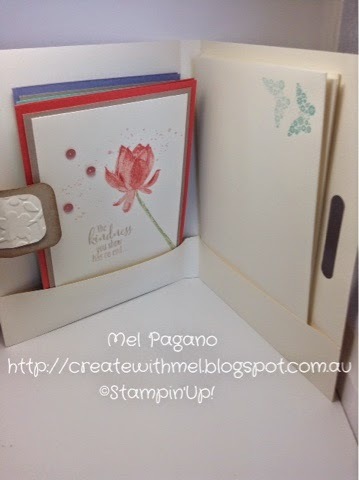 It is white on white and pre embossed so you can just add colour ( or leave it plain ). Colour it anyway you want – spritz, ink, sponge or dauber!!! It makes a beautiful, quick and easy addition to spice up any card. It also happens to fall into the Casing the Catty Challenge again this week of using some Saleabration DSP. Take a look at all the gorgeous creations HERE. I am really enjoying playing along. So what are you waiting for….every $90 earns you a free item from Saleabration. You can shop online and have the items delivered directly to your door anywhere in Australia….